We bought the Hamilton Beach Deep Fryer because our old fryer was beginning to show its age. This model was on sale for $30 so we couldn't pass the opportunity up. We're glad we didn't as this is the best fryer we've ever owned. The fryer comes in five parts: the pan, the stand, the heating element, the cord, the basket, and the lid. The interior of the fryer's pan had a sticky residue inside that needs to be cleaned before oil can be added. We ended up leaving the removable interior pan to soak in boiling hot water and soap overnight. If you're buying this for a party buy it at least a day ahead so you can remove the residue. For cooking the fryer is excellent. It heats up within five minutes and will cook your food rapidly no matter what the condition of the oil in the pan is in. The design of the fryer prevents little pieces of soot from sticking to the food since there's about an inch of space between the bottom of the pan and the bottom of the basket leaving behind aesthetically pleasing food. 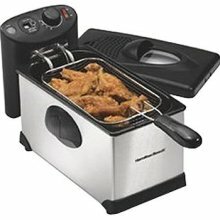 The Hamilton Beach Fryer is a good fryer for individuals and small families. Larger families will need to be aware that the basket and fryer is smaller then other home fryers so they may need to cook their food in batches. Overall it is a very good fryer for the price and a great first deep fryer. Join in and write your own page! It's easy to do. How? Simply click here to return to Electric Deep Fryer Reviews.